Being over 40 means going to sleep with a night cream. Every night. This is my new cream on the shelf. 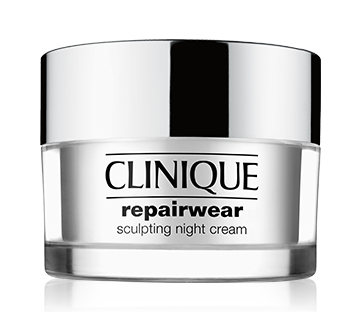 Just the name; Repairwear sculpting night cream got me. Even though I find it hard to believe some of the promises beauty creams in general seem to deliver, I do believe in making the most out of the night sleep for the skin, since it´s the best time for the skin to absorb active ingredients. This Clinique cream has a luxurious feel of richness but still being light, and is said to contour, lift and firm every night (that I believe:) This together with a night mask provides for a full night of beauty sleep. I use so many Clinique products. I can't believe I've not tried this one yet. As you say, the name sounds impressive!